We are excited! 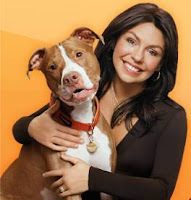 Rachael Ray will be receiving one of For Love of a Dog jewelry designs. Created especially for her, this one of a kind dog lover bracelet is a stylish combination of dog bones and bling! According to tracking information, this bracelet (pictured below) will arrive Friday. I've decided Friday the 13th is my lucky day! The focal is a hand crafted, flamed copper dog bone with two dimensional details. Lovely warm shades of rose pink, hot pink and raspberry are accented with gold granulation dots. I combined coordinating big, fat rose pink crystals and some gorgeous handmade artisan lampwork beads. Each lamp worked bead is unique and include amber with raised rose pink flowers, caramel with raised soft pink flowers, and swirls of caramel and tan with raspberry pink raised dots. Lovely colors with a floral touch make for pretty bling! 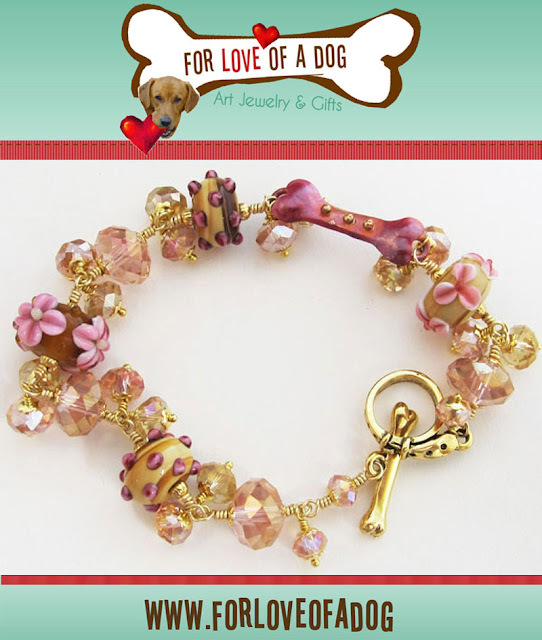 Do you wish you, too, could have a special dog lover bracelet similar to this one? Fetch our dog bone jewelry or our new dog lover jewelry now! For Love of a Dog Jewelry & Gifts is a proud member of The Artisan Group, which makes this kind of opportunity possible for handmade artisans. OMG! How wonderful! The bracelet is gorgeous! That is a beautiful piece!! RR is a lucky woman.